The massacre of civil rights protestors has always had the appearance of a deliberate colonial strategy to suppress nationalist oppression to British rule. Within a period of 30 minutes on January 30, 1972, the British Parachute Regiment had shot 13 dead and injured almost two dozen. A fourteenth victim later died of his injuries. 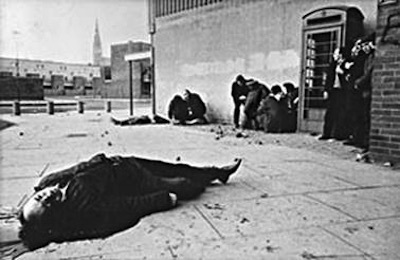 After the massacre, the British military claimed they had been attacked first and accused the protesters of being ‘terrorists’ and members of the IRA. This was always rejected as a lie and is now officially discredited. But Kate Nash, whose 19-year-old brother William was among those shot dead when the paratroopers opened fired on January 30, 1972, has said the British government and PSNI police are engaged in a larger cover-up. She believes the soldiers were told to fire upon unarmed demonstrators, rather than the shooting being the result of troops disobeying orders as the Saville Inquiry claimed in 2010. No action was taken in response to that inquiry by the PSNI or judicial authorities for two years, a source of much anger for relatives. In July 2012 a murder investigation was finally launched following intense public pressure. Ciaran Shiels from Madden and Finucane solicitors, a lawyer representing the families, said that the current investigation has been an uphill battle from the beginning. “It is important to bear in mind that after the Saville inquiry reported in 2010, it wasn’t a matter that the PSNI of its own volition took to investigate -- even though Saville had said that these people had been shot without justification,” he said. No arrests have been made, and families were told that the military suspects -- the soldiers identified in the Saville report as having fired the fatal shots -- have yet to be interviewed. Shiels, the solicitor, said it didn’t appear to have occurred to the police that they could and should compel the British Army members to co-operate, and that they could be charged and jailed for failing to do so. He also said stressed that a great number of civilian witnesses that day would have been fleeing for their lives or hiding from the barrage of bullets the soldiers were firing, while those soldiers not firing at the crowd would have had a privileged and safe view of events. Kate Nash believes that the findings of the Saville inquiry, as scathing as they were, did not reveal the full truth of the events of the day, and there are political reasons why the police are not investigating the murders fully. The British government, she says, is afraid of what the soldiers might say if they were in court. “It is a terrible blow to us all. They could arrest soldiers right now and the fact is they are not. The government doesn’t want to take soldiers to court, and I’ll tell you why -- because it went further than those soldiers,” she said. She recounted how her brother’s dying body was abused by the soldiers. Her mother had been in hospital and did not attend the march, and was only well enough to be told about the death on the day of William’s funeral.